The 2012 annual report of the Federal Geographic Data Committee (FGDC) demonstrates our commitment to the collaborative development of geospatial data and technology. Substantial progress has been made on a number of key initiatives that the FGDC member agencies can be proud of. We are on the cusp of transformative change in the manner in which the Federal Government conducts its geospatial business. The challenge of implementing the changes will continue to occupy our attention over the next years. During the past year, the FGDC member agencies substantially advanced the Geospatial Platform initiative. The Geospatial Platform will provide a robust suite of geospatial data, services, and applications for use by Federal agencies and their State, Tribal, regional, and local partners. 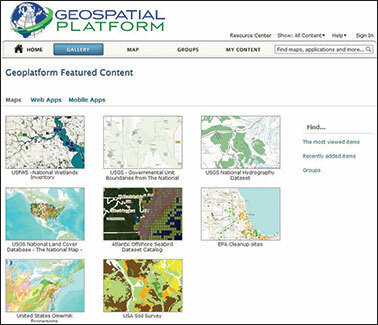 In 2012, the FGDC launched the prototype version of the Platform at www.geoplatform.gov. We are making continuous improvements to the site to add new capabilities and tools. The FGDC community also developed the value proposition and a comprehensive business plan for the Geospatial Platform. The business plan was developed with extensive input from FGDC member agencies and from external partners represented on the National Geospatial Advisory Committee. The business plan describes a clear path forward for the build-out of the Platform, the interagency funding strategy, and an inclusive governance model. The ongoing development of the Platform will be a continuing priority for the FGDC community. 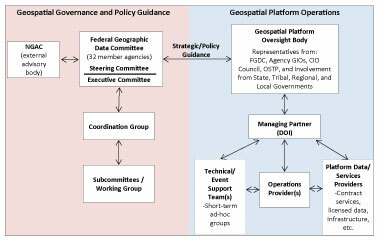 The FGDC has also taken important steps to implement the management practices described in the Supplemental Guidance to Office of Management and Budget (OMB) Circular A–16, “Coordination of Geographic Information and Related Spatial Data Activities.” The Supplemental Guidance outlines a process to use a portfolio management approach to more effectively direct and administer Federal geospatial assets and investments. During 2012, the FGDC updated and revised the National Geospatial Data Asset (NGDA) themes and datasets that will provide the foundation for the portfolio management approach. Coordination with theme lead agencies to define roles and responsibilities and stewardship requirements has been critical. Continued implementation of this process will be a priority for the FGDC in the coming year. The FGDC has also made significant progress in the area of geospatial standards. The FGDC endorsed the Coastal and Marine Ecological Classification Standard (CMECS) in 2012. CMECS offers a simple standard framework and common terminology for describing natural and human-influenced ecosystems, from the upper tidal reaches of estuaries to the deep ocean and the Great Lakes. The FGDC also organized and led a Metadata Summit to identify challenges and opportunities for the implementation of the international geospatial metadata standard, ISO 19115, and its associated standards. Fiscal year 2013 will focus on continued collaboration with Federal and non-Federal partners to advance national geospatial programs. We will continue to develop the Geospatial Platform for the benefit of the agencies and the public we serve. We are pleased with the progress being made by the FGDC and look forward to another productive year. On behalf of the FGDC Steering Committee, I want to recognize the steadfast efforts of the employees of organizations across the country who carry out the work of the FGDC. These individuals demonstrate on a daily basis their dedication to fulfilling the trust of the American people and fulfilling their commitment to this important program. 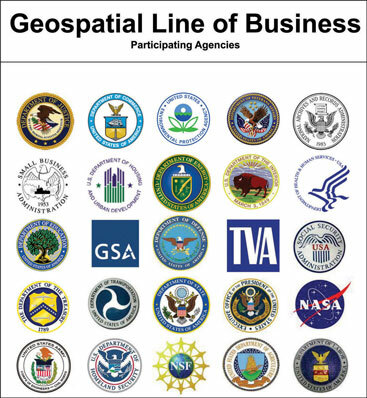 The Geospatial Line of Business (Geo LoB) provided the organizational umbrella for implementation of the Office of Management and Budget (OMB) Circular A–16 Supplemental Guidance, management of the National Geospatial Data Asset (NGDA) portfolio, and implementation of the Geospatial Platform initiative. In addition, Geo LoB activities for fiscal year 2012 included the creation of communication materials for use during outreach events, internal meetings and briefings, and for posting on the FGDC website. For more information click here. OMB Circular A–16 Supplemental Guidance provides the foundation for a portfolio management approach to National Geospatial Data Asset (NGDA) management units called Themes and the associated NGDA Datasets. The past year saw the finalization of the NGDA Themes; continued refinement in the identification of datasets and their mapping to NGDA Themes; and outreach and identification of the proposed NGDA Theme lead agencies and Theme lead contacts. For more information click here. This year the Geospatial Platform as an OMB shared service was established, the first Geospatial Platform collaboration group—Hurricane Response—was set up, the Geospatial Platform Oversight Body model was developed, the U.S. Department of the Interior was designated the Managing Partner organization for the Geospatial Platform, the Geospatial Platform Value Proposition document was released by the FGDC, the Geospatial Platform Business Plan was finalized, and the Business Case and funding requirements for fiscal year 2014 and beyond were developed. For more information see Working Together to Build the Geospatial Platform and The Geospatial Platform Shares and Coordinates Resources. The ten Federal GeoCloud Sandbox projects, which were identified in 2011, gained experience deploying ArcGIS and OpenGeo standards-based Web services in the GeoCloud environment using the Amazon platform. One of the ten projects was instrumental in the Cloud redeployment of the National Wetlands Inventory map and data services through the “Wetlands Mapper” application, now hosted on Amazon (see featured article). Twelve new projects were established this year with a focus on migrating public-facing data and map servers to the Cloud environment as resources to be registered with the Geospatial Platform. For more information click here. During the past year the National Geospatial Advisory Committee (NGAC) analyzed and provided feedback and recommendations for the Geospatial Platform initiative, geospatial workforce development, innovative strategies for geospatial programs and partnerships, the Landsat Program, the LightSquared/GPS interference issue, the National Address Database, the National Hydrography Dataset, and the proposed National 3D Elevation Program. For more information click here. The FGDC endorsed the Coastal and Marine Ecological Classification Standard (CMECS) in 2012. CMECS offers a simple standard framework and common terminology for describing natural and human-influenced ecosystems, from the upper tidal reaches of estuaries to the deepest portions of the ocean. For more information click here. The FGDC organized and led a Metadata Summit to identify challenges and opportunities for the transition to and implementation of to the International Organization for Standardization (ISO) sponsored international geospatial metadata standard, ISO 19115, and its associated standards. Fifty-two participants representing twenty-five agencies and organizations participated in the full-day Summit that resulted in the revision of FGDC guidance for metadata (www.fgdc.gov/metadata/geospatial-metadata-standards). For more information click here. Ten States plus the District of Columbia completed and began implementing strategic and (or) business plans that facilitate the coordination of geospatial programs, policies, technologies, and resources in their State/District and with the Federal Government. For more information click here. The FGDC coordinated ISO metadata training with the National Oceanic and Atmospheric Administration’s National Coastal Data Development Center as part of the FGDC Metadata Summit. 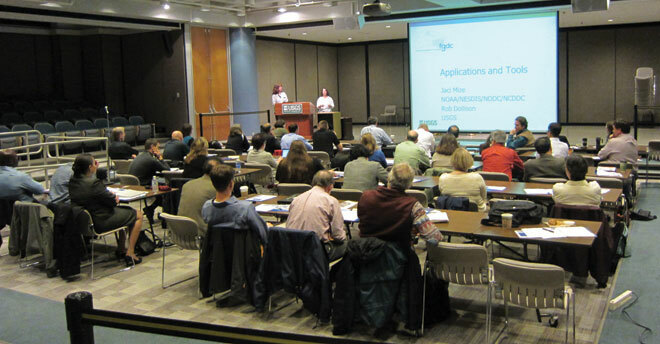 Twenty-five participants from Federal, State, and private sector organizations participated in the full-day workshop held at the headquarters of the U.S. Geological Survey in Reston, Virginia. For more information click here. Aviation safety, energy development, flood plain management, resource assessments, and many other government activities depend on access to accurate, up-to-date topographic maps and geospatial data. Remarkably, modern mapping information does not exist for the majority of land in Alaska, although significant resource, safety, and national security interests intersect across the Alaskan landscape. To address this issue, the U.S. Department of the Interior and the State of Alaska co-hosted an Alaska Mapping Roundtable meeting for senior Federal and State executives to raise awareness about the status of and plans for completing topographic mapping in Alaska and to explore alternatives for a joint funding strategy. The Roundtable was held in Washington, D.C., on June 28, 2012. More than 20 Federal agencies participated because of their mission-critical needs for this information. Alaska participants included representatives from the Governor’s Office, the Alaska Departments of Transportation and Natural Resources, the University of Alaska, and Alaska’s congressional delegation. Meeting highlights included presentations outlining the benefits, requirements, and status of completing the mapping of Alaska. A lively discussion followed, and consensus was quickly reached that topographic mapping for Alaska must be accelerated. To accomplish this, the U.S. Department of the Interior established an interagency executive committee to coordinate and oversee the Federal role in mapping Alaska; the committee’s goal is to secure the resources necessary to complete mapping of Alaska by 2018. Additional information is available at staging-nationalmap.usgs.gov/alaska/roundtable.html. Anne Castle, Assistant Secretary for Water and Science, DOI, gives her opening remarks. (From left to right) Anne Castle; Marcia McNutt, Director, USGS; Mead Treadwell, Alaska Lt. Governor; and Marc Luiken, Commissioner, Alaska Department of Transportation. Roundtable participants listen to Lt. Governor Treadwell's address. Government, industry, and individual citizens increasingly rely on information linked to a location for planning, investment, and management activities. The ability to display information through interactive maps helps to communicate complex ideas more clearly and supports informed decision making. Because geospatial information requires a significant investment of resources, many government agencies and nongovernment organizations are coordinating their efforts in order to reduce costs, improve the quality of services, and increase efficiency. The Federal geospatial community is developing the Geospatial Platform to promote improved coordination and more effective use of geospatial information. The Geospatial Platform will promote sharing across multiple levels of government and with partners in the private sector to provide better access to geospatial data, services, applications, and infrastructure. The partner agencies of the Federal Geographic Data Committee (FGDC) have worked together to implement Version 1 of the Geospatial Platform. The Platform’s implementation begins to illustrate the path forward in both technology and policy as this latest strategy to advance the development of the National Spatial Data Infrastructure (NSDI) progresses. Past NSDI initiatives have helped form the vision and have provided the foundational policies, strategies, and content for the Geospatial Platform. These FGDC-led initiatives include: (1) the Geospatial Clearinghouse Network, (2) Geospatial One Stop, and (3) the Geospatial Line of Business. The Geospatial Platform represents an evolution of these efforts, providing an opportunity to apply lessons learned from these preceding geospatial initiatives and to advance new capabilities for the community. The figure illustrates the progression of these initiatives. The progression of geospatial initiatives led by the FGDC. Why is the Geospatial Platform Needed? Address Issues of National Importance. The Geospatial Platform can effectively support problem solving and policy formulation for the complex issues facing the Nation. Issues and events that affect the economy, employment, the environment, public health and welfare, security, and quality of life will benefit from the decision support tools, shared applications, visualization, and endorsed geospatial data made available through the Geospatial Platform. Solutions—data, services, and applications—developed once and published through the Geospatial Platform can be reused. For instance, tools and applications developed by one agency to support hurricane response can potentially be applied to responses to floods or other natural disasters. Sharing applications and delivering endorsed data through the Geospatial Platform will save time and money, as well as promote consistency. Best practices from organizations across the United States can be brought to bear as agencies address local and national issues. Support Decision Making. Federal agencies and their partners invest significant resources in geospatial data, services, technology, and expertise to support their business operations. Data and information resources are among the most valuable assets any agency possesses. However, policy makers and executive managers alike observe that oftentimes the data and tools they need to make decisions are not readily available in useful or intuitive forms. This can result in delayed responses, lost opportunities, and higher costs. In addition, current practices have not yielded consistent data-publishing methods, leading to gaps in the availability of current and relevant geospatial data for informed decision making. The ability to create and share targeted geospatial applications that more directly respond to decision makers’ needs is a key feature of the Platform. Move Toward Shared Services. The Geospatial Platform enables the sharing of data, services, and applications across the government on a shared Cloud infrastructure. This aligns with the government-wide shared services strategy (https://cio.gov/it-shared-services/) intended to improve return on investments, close productivity gaps, and increase communications with stakeholders. The sharing of data, services, and applications through the Geospatial Platform will reduce the number of data centers, as well as reduce the cost of data, hardware, and software, and increase information technology (IT) security and efficiency. The sharing of data, services, and applications through the Geospatial Platform will also give users faster and more flexible and economical ways to share information. The Geospatial Platform Map Gallery. The Geospatial Platform Map Viewer displaying USDA’s Soil Survey Geographic (SSURGO) data. Meet Common Business Needs. Geospatial data, shared services, and tools also inform day-to-day Federal agency management activities, including administering grant programs, regulatory oversight, emergency preparedness and response preparations, facilities and asset management, human resource management, and financial and performance management. Geospatial data, shared services, and applications to support these cross-government functions frequently exist within multiple agencies, whereas they should be developed once and shared across agencies and levels of government, thereby saving money and promoting consistent approaches. The Geospatial Platform will leverage existing investments and avoid unnecessary costs associated with duplication of efforts. For more information see “Geospatial Platform Value Proposition” at resources.geoplatform.gov/documents. How Will the Geospatial Platform Promote Effective Management of Federal Geospatial Assets? Portfolio management of Federal geospatial assets will be a key aspect in the development of the Geospatial Platform. The Geospatial Platform will leverage the new geospatial portfolio management processes being implemented through the OMB Circular A–16 Supplemental Guidance, which directs Federal agencies to adopt a portfolio management approach for geospatial information and defines a recommended portfolio management process. increased return on existing geospatial investments by promoting the reuse of data, applications, and tools. For more information see www.fgdc.gov/policyandplanning/a-16/key-roles-and-responsibilities-a16-supplemental.pdf. 2012 has been a very busy year for the Geospatial Platform initiative. Partners from across the FGDC community have been heavily engaged in the development of the “Business Plan for the Geospatial Platform” (Business Plan) which was approved for released by the FGDC Steering Committee in September 2012. The Business Plan complements previous FGDC member-developed products in support of the Geospatial Platform, such as the “Modernization Roadmap for the Geospatial Platform” and “Building the Business Case for the Geospatial Platform—The Value Proposition.” The Business Plan serves as a “what and how” document, providing an overview of the operational elements and the organizational structure of the Geospatial Platform. An overview of the Geospatial Platform Oversight Body. The Geospatial Platform Oversight Body will serve as the management oversight body and technical change control board for the Geospatial Platform. Members may include representatives of Federal, State, Tribal, and local governments. The figure below shows the configuration of the new Oversight Body and its relationship to the FGDC structure. Selection of the Managing Partner organization for the Geospatial Platform. The U.S. Department of the Interior has been selected as the Managing Partner for the Geospatial Platform initiative. Responsibilities for executing components of the overall program will be shared among organizational units within the Department, including the U.S. Geological Survey and the FGDC Secretariat; the overall leadership of and responsibility for the initiative lie within the U.S. Department of the Interior’s Office of the Chief Information Officer. Selection of a funding model for the Geospatial Platform. The Business Plan provides details on funding needs and solutions for the near term (fiscal year 2013) and long term (fiscal year 2014 and beyond). Multiple funding models were considered in the development of the Business Plan, and FGDC member agencies came to agreement on the implementation of a tiered cost-sharing model for funding the further development and future operations of the Platform. tighter integration with the Data.gov activities and approval workflows. Body and its relationship to the FGDC structure. The technical capabilities of the Geospatial Platform have been exercised this year through the establishment of the first FGDC Geospatial Platform “Tiger Team” that is focused on enabling a number of government partners to work toward establishing an operational hurricane preparedness and response capability. Utilizing the Geospatial Platform’s shared Cloud computing infrastructure and access-controlled collaborative workspaces, the team established the Hurricane Response Community that is leveraging geospatial data and other information from multiple sources to help provide collaborative understanding and situational awareness. Enhanced Content Publication and Data Registration. In concert with the Data.gov team, the metadata workflow will be improved to streamline the process of registering data with the Platform and the common metadata catalog at Data.gov. The “Geospatial Marketplace” concept of publishing planned data acquisition will be redeployed to encourage coordinated data development and cost-sharing, which will support portfolio management objectives. Data Hosting Services. The Geospatial Platform Managing Partner will be developing shared Cloud computing infrastructure for data and application hosting by the FGDC community. This will include opportunities for Cloud hosting of data and map services defined as Nationally Significant Data Assets under the Supplemental Guidance to OMB Circular A–16. Next Generation of the Geospatial Platform Website. The Geospatial Platform website (www.geoplatform.gov) is in the process of being revamped. A number of major improvements will include: expanded developer and publisher how-to documents and examples; more dynamic content in terms of rotating gallery images, blog posts, and social media; and, in partnership with Data.gov, expanded user communities where colleagues and partners will be able to collaborate using geospatial information. Technological advancements are important to the overall success of the Geospatial Platform; however, a true measure of success in this effort will be the volume and quality of nationally significant data that is made available through this initiative. Throughout 2013, the entire FGDC community will be working together toward implementation of the Supplemental Guidance to OMB Circular A–16, and as the network of theme and dataset managers is defined, more and more high-quality content will be available through the infrastructure of the Geospatial Platform. The Geospatial Platform team looks forward to another great year helping to make this initiative a success and improving the ways in which government manages and utilizes geospatial information. Customers that rely on National Oceanic and Atmospheric Administration (NOAA) data, such as nautical charts, bathymetry, coral reef habitat, and hurricane information, need quick and easy access to these datasets without having to understand which NOAA office created them. To help provide access to authoritative geospatial data that have been quality controlled and checked, NOAA recently released the NOAA GeoPlatform (www.geoplatform.noaa.gov). This Web-based resource provides NOAA customers, partners, and staff members with a centralized platform for discovering and accessing much of NOAA’s distributed geospatial data, services, and applications. Users have the capability to pull in multiple NOAA datasets, along with other data and services of interest, and mash the data into a single, easy-to-use mapping interface to create additional map-based products for enhanced decision making within their operations. The NOAA GeoPlatform employs a three-tiered management approach using Esri’s ArcGIS Portal software, Amazon Web Services’ EC2 Cloud infrastructure for hosting, and NOAA staff providing the content, oversight, and management. The NOAA GeoPlatform is the focal point for NOAA’s contribution to the national Geospatial Platform initiative led by the FGDC. NOAA is a lead participant in the national initiative and is making all content provided through the NOAA GeoPlatform available to the national Geospatial Platform, which will expose NOAA data, services, and applications to an even broader audience. The U.S. Department of the Interior (DOI) Fish and Wildlife Service (FWS) is the principal Federal agency providing information to the public and other agencies about the extent and status of the Nation’s wetlands; information is provided through the National Wetlands Inventory (NWI) Program. The NWI Program provides this habitat information to a diverse clientele, including other FWS programs; other Federal agencies; State, Tribal, and local governments; private industry; multinational corporations; educators; and researchers worldwide. The FWS must continue to develop contemporary applications for its data that will facilitate broader use and relevancy for integrated natural resource management and decision making in the future. Advances in information technology and geographic information systems have influenced public expectations for greater utility and functionality from Government data sources, and there is an ever-growing importance placed on realizing efficiencies in data management and delivery systems. 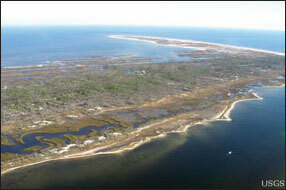 The FWS has modernized its geospatial services to meet demands for wetlands data. The Wetlands Geodatabase and the Wetlands Mapper, an Internet discovery portal, provide technological tools that allow the integration of large relational databases with spatial information and map-like displays. The NWI Program’s Wetlands Geodatabase, which houses all FWS digital geospatial wetlands data, including digital data contributed by outside cooperators, forms the Wetlands Layer of the National Spatial Data Infrastructure (NSDI). The Wetlands Data Layer is one of the datasets of national significance administered by the Federal Government. The Wetlands Data Layer constitutes one of the largest polygonal databases in the world and is visited over 60 million times each year through Internet access. In 2010, the FGDC’s Architecture and Technology Working Group invited FWS to participate in one of the ten GeoCloud Sandbox Initiative2 projects that tested the efficacy of using Cloud computing to serve the Wetlands Data Layer. Wetlands Mapper screen capture showing wetland features and legend information. In September 2011, the Wetlands Mapper became the first geospatial service application to reach a Cloud computing platform from the U.S. Department of the Interior. The Wetlands Mapper is publically available in a Cloud environment at www.fws.gov/wetlands/Data/Mapper.html. Amazon Web Services was identified as the Cloud platform of choice; Amazon services are acquired through the General Services Administration Apps.gov contract, with the Esri software (Platform as a Service) provided through the DOI Enterprise Licensing agreement. Operational use of the Cloud environment has shifted focus from asset ownership to service management and has eliminated many of the concerns regarding IT system consolidation. Response time, reliability, and reserve demand capacity have met expectations and user feedback has been very positive. Annual costs are expected to be considerably lower as data servers are phased out and maintenance costs are eliminated. Additional improvements in accessibility, reliability, and redundancy should also be realized. Naturally, one of the big hurdles for any government customer going to Cloud computing is security. The Wetlands Mapper was the first application utilizing the Esri platform from DOI to reach the Cloud environment, and one of the most challenging aspects was to ensure security measures. Fortunately, by partnering with U.S. Geological Survey Wisconsin Internet Mapping (WiM), developers were able to work closely with the FGDC Principal Systems Architect at DOI and ensure compliance. Previous work to ensure common structures, methods, formats,3 and complete metadata used in geographic information system technologies greatly facilitated this process. The result of these efforts cap a modern, efficient form of data delivery for the wetlands geospatial data layer of the NSDI and capitalize on years of data collection efforts by developing scientifically sound, technologically relevant tools for data distribution, display, and analysis of aquatic resource information. FWS has promoted the NSDI model through coordinated collection and dissemination of wetlands geospatial data. As part of this effort, the NWI Program has partnered with over 100 Federal, State, Tribal, regional, and local agencies; non-profit entities; and private businesses to map wetlands, deepwater, and riparian areas. In fiscal year 2012, NWI had 20 partners funding or producing data that contributed to the Wetlands Data Layer of the NSDI. 1Federal Cloud Computing Strategy, U.S. Chief Information Officer, 2011 (cio.gov/wp-content/uploads/downloads/2012/09/Federal-Cloud-Computing-Strategy.pdf). 2Funding provided by the General Services Administration. In addition to the FWS, Federal participants included the Census Bureau, EPA, NOAA, USDA, and USGS. 3FWS developed the wetland classification system (www.npwrc.usgs.gov/resource/wetlands/classwet/index.htm) that was subsequently adopted by the FGDC as a national standard for mapping, monitoring, and reporting on wetlands. FWS has also worked closely with FGDC to develop a Wetlands Mapping Standard. species, such as the manatee, depend on wetlands. from the FWS image library. The Geospatial Line of Business (Geo LoB) aims to further refine the opportunities for optimizing and consolidating Federal geospatial-related investments to reduce the cost of government and, at the same time, improve services to citizens. Cross-agency coordination of geospatial activities can identify, consolidate, and reduce or eliminate redundant geospatial investments. Developing the Geo LoB resulted in a more coordinated approach to producing, maintaining, and using geospatial data and will ensure sustainable participation from Federal partners to establish a collaborative model for geospatial-related activities and investments. The Geo LoB supported the continued implementation of the Office of Management and Budget (OMB) Circular A–16 Supplemental Guidance and the planning and development of the Geospatial Platform, discussed below. The creation of communication materials for use during outreach events, internal meetings, briefings, and for posting on the FGDC website is another activity supported by the Geo LoB in fiscal year 2012. In fiscal year 2013 the Geo LoB will continue to provide the management oversight for OMB Circular A–16 Supplemental Guidance and the Geospatial Platform. performance across the Federal Government. The Supplemental Guidance to OMB Circular A–16 plays a key role in meeting the vision of the National Spatial Data Infrastructure to enhance the understanding of our physical and cultural world by gathering spatial data from multiple sources (Federal, State, Tribal, and local governments, academia, and the private sector) and sharing access to the data so that it is readily available and easily integratable. The Supplemental Guidance further defines and clarifies elements of OMB Circular A–16 to facilitate the adoption and implementation of a coordinated and effective Federal geospatial asset management capability. The Supplemental Guidance will improve support of mission-critical business requirements of the Federal Government and its stakeholders. It also provides the foundation for a portfolio management approach to National Geospatial Data Asset (NGDA) Themes and their associated NGDA Datasets. Each Theme contains multiple associated geospatial datasets (with attribute records and coordinates) that are documented, verifiable, and officially designated to meet recognized standards. Portfolio management, described in the Supplemental Guidance, is the coordination and management of Federal geospatial data assets and investments to most efficiently support national priorities and government missions. Portfolio management applies consistent management approaches that help increase the quality of data through use of best practices and documentation in a manner that reduces duplication and cost, provides greater accessibility, and supports shared services across the Federal Government. Through portfolio management, NGDA Datasets are organized into management units called Themes which are managed by Theme Leads who are to provide cross-agency leadership and coordination for the Theme. The Datasets are managed by Dataset Managers who are to provide coordination and standards for the Datasets at a national level. Datasets within Themes will be made available through the Geospatial Platform (www.geoplatform.gov). During fiscal year 2012 the FGDC Steering Committee approved a revised list of NGDA Themes, updating and normalizing the themes identified in OMB Circular A–16, Appendix E. The theme descriptions, scope, and initial list of associated datasets was developed and continues to evolve. In addition, lead agencies for most of the NGDA Themes were proposed and Dataset Managers were identified for many of the Datasets. The NGDA Themes and their description and scope can be found in Appendix C. A link to the NGDA Datasets list is available at www.fgdc.gov/initiatives/portfolio-management. In early fiscal year 2013, the FGDC Steering Committee will approve a revision to the NGDA Themes and vote on the endorsement of the proposed Theme lead agencies. The FGDC Coordination Group will work to complete the identification of NGDA Datasets and their stewards and institute portfolio management processes that will include developing meaningful and consistent performance metrics for NGDA Themes and Datasets. The Datasets will be made available to the Geospatial Platform. This work will further the implementation of OMB Circular A–16 Supplemental Guidance. Example of how a Theme within the NGDA Portfolio will be set up. The Geospatial Platform (www.geoplatform.gov) was initiated through collaboration with the Office of Management and Budget. 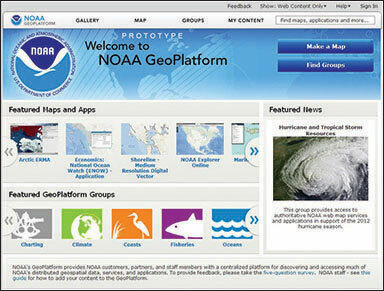 The Platform includes a portal with a catalog to manage Federal and non-Federal geospatial resources. The Platform also will be providing additional visualization, analysis, portfolio management, and community coordination capabilities. The Platform relies on the Data.gov catalog managed by the General Services Administration and the distributed harvest of catalogs and service descriptions from participating agencies that come from multiple levels of the geospatial community. The governance of the Platform has been defined and ratified. The U.S. Department of the Interior is the Managing Partner of the initiative, and the FGDC Secretariat is host to the Project Management Office. The initiative participates in the OMB Shared Services activity, having registered its core catalog and data service capabilities with the government-wide directory. For more information click here. register geospatial Web services with the Geospatial Platform. Objectives and outcomes of GeoCloud. Two Platform as a Service (PaaS) images were developed for deployment by the projects—one is based on Windows 2008 Server R2 with ArcGIS 10.0, the other is based on CentOS (Linux 64) and OpenGeo Enterprise Suite and GeoNode software. These two solutions were derived from requirements noted by the projects, with the goal of creating a minimum number of software images that could share the same security profile and thus simplify the system approval process. 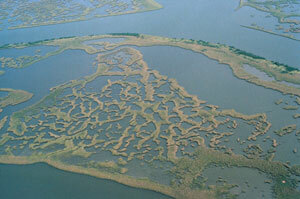 For a description of the Wetlands Mapper in the Cloud, click here. While FGDC agencies have taken steps to use Cloud services to improve efficiency and provide better services, State partners have taken similar steps. Within the last year, four States (Colorado, Montana, Oregon, and Utah) have partnered with the Western States Contracting Alliance (WSCA) to establish competitively bid Cloud hosting contracts with four Cloud vendors—two specializing in general Cloud hosting (Infrastructure as a Service) and two specializing in GIS Cloud hosting (Platform as a Service). The WSCA team went through a rigorous process of reviewing the marketplace via a Request for Information (RFI), developing a detailed Request for Proposals (RFP), and comparing the RFP responses, which included testing vendor offerings for price and performance against predetermined, production system scenarios. The team also carefully reviewed requirements for security certifications, physical location of data centers, provisioning of new hardware/software, and pricing discounts with two primary objectives in mind: (1) cost efficiencies, and (2) flexibility and scalability. The resulting contracts are open to all Federal, State, Tribal, and local governments that sign a participating agreement with WSCA. Further, additional volume discounts that result from the cumulative use of these contracts will be passed along to each participant. For more information, contact the WSCA www.aboutwsca.org. Provided feedback and recommendations on key Federal initiatives and topics, including the Geospatial Platform Initiative, the National Address Database, the National 3D Elevation Program (3DEP), revision of OMB Circular A–16 data themes, the stewardship survey for the National Hydrography Dataset (NHD), and management of Tribal land records. Adopted papers on geospatial workforce development and innovative strategies for geospatial programs and policies. Developed papers addressing two important aspects of the Landsat program: (1) the economic value of Landsat data, and (2) charging fees for Landsat data. Approved a resolution expressing concern regarding the adverse impacts that the proposed LightSquared network would have on the Global Positioning System (GPS). Designated Points of Contact (POCs) for significant Federal geospatial programs and initiatives. The role of the POCs is to monitor program activities and inform NGAC members about key developments. In fiscal year 2013, the NGAC will continue its multifaceted activities that provide advice and feedback on the development and implementation of key geospatial topics. The major topics include the continued development of the Geospatial Platform, the development of portfolio management approaches, geolocation privacy issues, and partnerships with other levels of government. For more information about NGAC activities see www.fgdc.gov/ngac. Elevation data are essential for conservation, hazard mitigation, infrastructure development, national security, and many other information technology applications. The National Enhanced Elevation Assessment (NEEA), completed in December 2011, was conducted to (1) document national level requirements for improved elevation data, (2) estimate the benefits and costs of meeting those requirements, and (3) evaluate multiple program-implementation scenarios at the national level. The assessment was sponsored and funded by member agencies of the National Digital Elevation Program. The assessment participants represented 34 Federal agencies, agencies in all 50 States, selected local government and Tribal offices, and private and not-for-profit organizations. A total of 602 mission-critical activities were identified within 27 defined business use categories that need significantly more accurate data than are currently available. The results of the assessment indicate that enhanced elevation data have the potential to generate $13 billion in new benefits annually. Benefit-cost analyses were completed for 25 national program scenarios, which included various levels of elevation data quality, data replacement cycles, and cost. Each scenario would implement a national data-collection strategy to achieve cost efficiencies and to meet the requirements of multiple organizations. Based on NEEA results, a 3D Elevation Program (3DEP) initiative has been developed by the USGS. The 3DEP initiative was endorsed by the National Geospatial Advisory Committee and the National States Geographic Information Council. 3DEP would provide uniform mid- to high-quality light detection and ranging (lidar) data over 49 States and the territories on an 8-year acquisition cycle. All of the scenarios call for interferometric synthetic aperture radar (ifsar) data coverage in Alaska because cloud cover and remoteness preclude consideration of lidar data over much of the State. More information on the NEEA and 3DEP may be found at nationalmap.gov/3DEP. A three-dimensional view from a lidar point cloud dataset along a section of Boulder Canyon in Colorado. Data courtesy of the National Center for Airborne Laser Mapping (NCALM). In June 2012, the FGDC took a major step forward to meet the need for organization of new and existing coastal and marine environmental data by endorsing the Coastal and Marine Ecological Classification Standard (CMECS). Click here for inset. In addition, the FGDC continued its participation as the representative of the civilian community to the Geospatial Intelligence Standards Working Group (GWG) chaired by the National Geospatial-Intelligence Agency. Most relevant to the FGDC is the work of the GWG Geospatial Web Services Focus Group, particularly in view of standards shared with the Geospatial Platform. Growing demands are being placed on the coastal and marine environment, but less funding is available to address the impacts of these demands. Faced with such circumstances, researchers and resource managers need a consistent approach to organize new and existing ecological data. In June 2012, the FGDC took a major step forward to meet this need by endorsing the Coastal and Marine Ecological Classification Standard (CMECS). CMECS is the result of a multi-organizational partnership led by NOAA to provide a common terminology and classification framework for researchers and managers working from the head of tide to the deep ocean and the Great Lakes. CMECS is unique among classification systems in that it incorporates all elements of the environment: the biota, substrate, geomorphology, and—unlike any other scheme in the United States—water column. Because CMECS units are based on ecological features, the standard is not limited by a particular technology; thus, data from a variety of sources can be integrated into a single structure. CMECS works at spatial scales that are both very broad and very narrow, from satellite oceanographic imagery to individual sediment grabs and video records. CMECS underwent a rigorous development process with input from more than 30 agency representatives, including EPA, FWS, NOAA, NPS, NRCS, USACE, and USGS, and topical experts. The standard is one of the most thoroughly vetted standards endorsed by the FGDC, with more than 850 comments received during the public review process. The developers of CMECS, recognizing the need of users to apply existing data whenever possible, built upon four standards already endorsed by the FGDC. 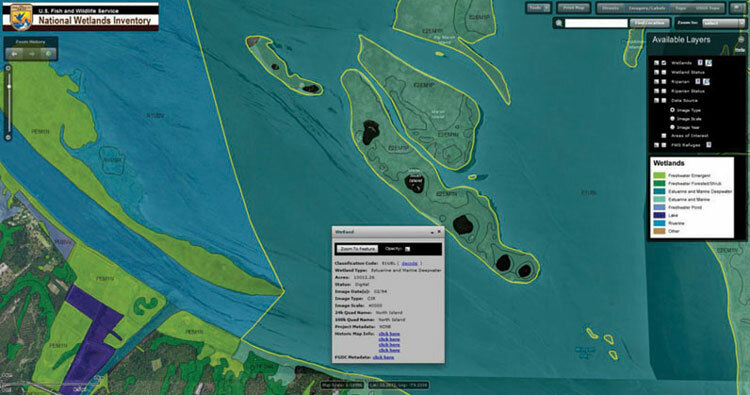 With CMECS availability, managers will be able to create comprehensive atlases of habitats. For example, managers in the Gulf of Mexico region could combine into a single database the corals data from NOAA, seagrass and shellfish data from State agencies, and sediment data from the USGS. Addition information and the standard are available at www.csc.noaa.gov/digitalcoast/publications/cmecs. 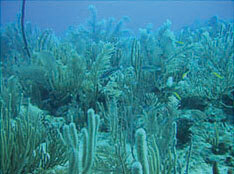 Example of a CMECS component – Biotic Subclass: Shallow/Mesophotic Coral Reef Biota. 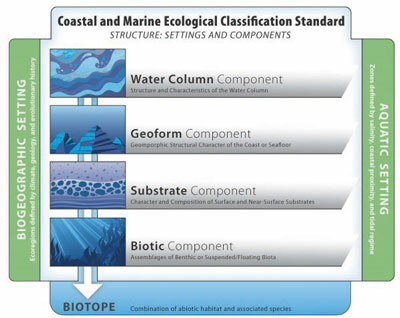 The CMECS classification of settings and components that describe the seascape. The Open Geospatial Consortium (OGC) is an international industry consortium of more than 460 companies, government agencies, and universities participating in a consensus process to develop publicly available interface standards. There is over a decade of involvement between the OGC and the FGDC. The OGC is a current member of the National Geospatial Advisory Committee, providing advice and recommendations. The FGDC and USGS share the cost of a strategic membership in the OGC. This membership level provides voting participation in the Strategic Member Advisory Committee, the Planning Committee, and the Technical Committee, with the FGDC Secretariat providing the voting member. The value of the OGC to the FGDC community was realized with the FGDC endorsement of more than 20 OGC standards. It is not by chance that these standards are meeting the needs of the FGDC community. FGDC community members participate in the OGC working groups and interoperability programs, bringing the community needs into the OGC process. The OGC provides a forum for independent, practical, and forward thinking action in the field of international location standards. Organizations depend on OGC standards to “geo-enable” information systems and services for use in disaster management, defense and intelligence, environment and natural resource management, mass market services, sensor websites, and many other domains of activity and technology. More information about the OGC is available on their website at www.opengeospatial.org. Sponsored by the USGS, the OWS–9 testbed final deliverable is due in December 2012 and involves building on the Cross Community Interoperability work of OWS–8 that includes (1) expanding semantic mediation to include conflation; (2) additional sources of data, including more complex data and unstructured data; (3) tracking the provenance of the data; (4) single query and access capability across multiple Federal geographic names databases; and (5) further investigation into encoding mappings. In 2012, the OGC introduced the North American Forum (NAF). The goal for the NAF is to address OGC standards requirements; OGC program coordination; and outreach and education needs of government, academic, research, and industry organizations in Canada, the United States, and Mexico. FGDC members can benefit from the NAF’s coordination mechanism to prioritize North American geospatial and location-specific interoperability requirements, incorporate these requirements into the OGC standards process, and share resources across OGC activities. GEOSS AIP–5 is expected to be completed in December 2012. The priority actions include GEOSS research and prototyping, GEOSS interoperability analysis and support, encouraging mature systems to interoperate with GEOSS Common Infrastructure, and ensuring access to GEOSS Data Collection of Open Resources for Everyone (Data-CORE). The purpose of this interoperability experiment is to advance the application of several OGC standards (WaterML, WFS, WMS, CSW, GML, and O&M) to the needs of hydrologic information systems. This will include addressing several approaches for water-quality data collection and forecasting. The pilot will engage broader community participation, such as to develop an international information model and GML application schema (for groundwater data) by harmonizing and extending existing initiatives, such as Ground Water Markup Language (GWML), the European INSPIRE Groundwater Model, and others. In October 2011, the FGDC organized and led a Metadata Summit to identify challenges and opportunities for transitioning to and implementation of the International Organization for Standardization (ISO) 19100 suite of metadata standards. Fifty-two metadata experts representing 25 Federal, State, local, and private sector organizations participated in a one-day Metadata Summit organized by the FGDC Secretariat and member agencies, NOAA, and the USGS. Motivated by the FGDC endorsement of the ISO 19100 suite of metadata standards, the summit provided an opportunity for NSDI stakeholders to discuss issues and opportunities related to ISO metadata transition and implementation. The outcomes of the Summit were presented to the broader NSDI community via a webinar that was recorded and is available at www.fgdc.gov/metadata/events/metadata-summit. The graphic below outlines the key recommendations generated during the summit and refined during the webinar. outline new training materials and reference resources in coordination with NOAA. Recommendations from the 2011 FGDC Metadata Summit. Metadata Summit recommendations have also become a valuable resource for FGDC member agencies. NOAA continues to lead ISO implementation efforts and has applied the summit outcomes in numerous efforts, including the development of an online ISO Metadata Training series (see Success Story), enhancement of their ISO metadata wiki site, and taking the lead in INCITS L1 efforts to update and enhance the ISO metadata XML implementation schema. The recommendations have also supported EPA efforts to incorporate the ISO standards into their ArcGIS-based metadata editor and USGS efforts to coordinate data development and application. A new Cooperative Agreements Program category was created to encourage ISO metadata exploration and to pilot the transition from the Content Standard for Digital Geospatial Metadata (CSDGM) to the ISO suite of geospatial metadata standards. Two awards were given for the documentation of the transition process and findings and for the development of recommendations that will aid others in making the transition. The FGDC coordinated the administration of an FGDC community review of the ISO standard 19115-1 Geographic information – Metadata – Part1: Fundamentals Draft International Standard (DIS). More than 100 comments were received; the comments were compiled, edited and submitted to INCITS L1. The FGDC October 2011 Metadata Summit at Reston, Virginia. To encourage and enable building the NSDI throughout the geospatial data community, the FGDC sponsors the Cooperative Agreements Program (CAP). The benefits to the community are not only financial but more importantly validate an organization’s geospatial endeavors, which leads to new opportunities. The CAP continues to (1) create collaborations within all sectors of government, (2) help develop an understanding of geospatial information in organizations new to the NSDI, (3) provide seed money to enable geospatial organizations to participate in the national effort to implement the NSDI, (4) promote the importance of geospatial data standards, (5) promote the development of standardized metadata by countless organizations, and (6) greatly expand implementation of geospatial services on the Internet. This year, 21 CAP projects were completed. As in past years, the projects continue to demonstrate the program’s diversity. Training and outreach are still a critical component of the CAP. 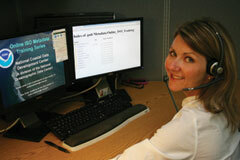 More than 150 people participated in metadata training that was provided in person and via a series of online webinars. The Appalachian Ohio Geospatial Data Partnership created an avenue for their community to share cadastral data at the local, regional, State, and Federal levels (see page 25). The Association of State Wetland Managers, Inc. was able to partner in organizing the Wetland Mapping Consortium and develop wetlands mapping training modules based on the wetlands standards (www.fgdc.gov/grants/2010CAP/projects/G10AC00204). Standards development was highlighted by the advancement of the Coastal and Marine Ecological Classification Standard (CMECS) to the final draft stage in the FGDC standards approval process. The three Geo-Synchronization projects were successful in developing and deploying a federated approach for exchanging framework data between State and national data stores (www.fgdc.gov/grants/2010CAP/2010CAPDescriptions#category2). In addition, Minnesota designed and implemented the first tangible stages of a collaborative and streamlined approach to managing municipal and township boundary data. Geospatial infrastructure Return-On-Investment (ROI) studies were completed by the Iowa Geographic Information Council and MetroGIS in Minnesota. The accomplishments of the Fifty States Initiative are listed below. In the 2012 program, CAP awards were given to 23 projects that address 6 categories. The planned CAP budget for fiscal year 2013 is $700,000, and these funds will be used to support up to 20 projects. For more information, please see www.fgdc.gov/grants. Source: Alaska Final Project Report, www.fgdc.gov/grants/2010CAP/InterimFinalReports/178-10-3-AK-FinalReport.pdf. This year marked the seventh anniversary of the Fifty States Initiative. The Initiative strengthens statewide coordination by advancing strategic and business plans and helps identify activities where strategy for Federal partnerships can and should occur. Since 2006, forty-nine States plus the District of Columbia and the U.S. Virgin Islands have received support through the NSDI CAP program. In 2012, Alabama, Alaska, and Ohio completed strategic and business plans and the District of Columbia, Florida, Idaho with Montana, Massachusetts, New York, Tennessee, and West Virginia completed business plans. In the spring of 2012, five awards were given to projects in Iowa, Maine, Maryland, Nevada, and North Carolina to develop and implement business plans. The business plans completed this year have focused on several relevant topics regarding improvement of geospatial coordination within States and furthering State-Federal partnerships. Recently completed business plan topics include: coordination of statewide orthophotography through the establishment of a standardized basemap (Florida); completion, distribution, and maintenance of a statewide cadastral data layer (West Virginia); a multi-State planning and implementation of geodetic control framework components (Idaho/Montana); and establishment of an intergovernmental geospatial coordination governance structure, along with data sharing best practices and collaborative education and outreach opportunities (Alaska). As the Fifty States Initiative continues into its eighth year, the emphasis will be on furthering business planning and the plan implementation process that helps States forge key partnerships. For more information about the Initiative, please see www.fgdc.gov/policyandplanning/50states. Map showing status of the Fifty States Initiative at the end of fiscal year 2012.
photo by Master Sgt. Mark C. Olsen. 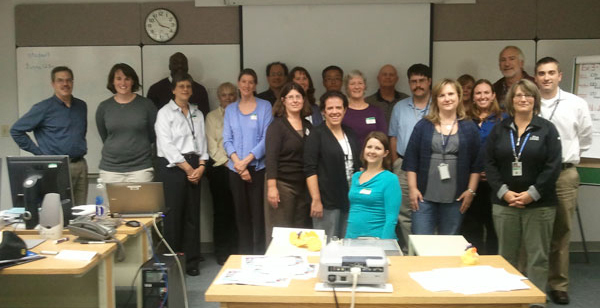 NOAA's ISO metadata training class held at the U.S. Geological Survey, Reston, Virginia. DataONE (www.dataone.org) is funded by the National Science Foundation to ensure the preservation, access, use, and reuse of multi-scale, multi-discipline, and multi-national science data by building a cyberinfrastructure that connects earth science data centers and by developing and facilitating a broad education and outreach program. DataONE comprises a distributed network of data centers, science networks, or organizations. These organizations can expose their data within the DataONE network using any established standards such as the FGDC Content Standard for Digital Geospatial Metadata. The USGS is the first Federal agency to participate in the DataONE effort—contributing significantly to the cyberinfrastructure and to leading and building the DataONE community. The USGS Core Science Metadata Clearinghouse (mercury.ornl.gov/clearinghouse/) is one of the initial “DataONE Member Nodes,” allowing the USGS and its partners to easily contribute metadata to DataONE. Additionally, the USGS and other government entities are also participating in building the DataONE community by participating in DataONE Working Groups. The FGDC Secretariat continues to support international efforts through the intergovernmental Group on Earth Observations and the Global Spatial Data Infrastructure (GSDI) Association. These activities are underpinned by the adoption of common techniques and standards to promote interoperability worldwide and thereby facilitate access to geospatial data and services. The FGDC Secretariat continued support for the intergovernmental Group on Earth Observations (GEO) and its Global Earth Observation System of Systems (GEOSS). Ivan DeLoatch, FGDC Secretariat Executive Director, is a co-chair for the Architecture and Data Committee, and Doug Nebert, FGDC Secretariat Senior Advisor for Geospatial Technology, is Task Lead for the key architectural task (IN-03) within GEO. The FGDC and USGS developed and continue to operate and evolve core catalog service capabilities for GEOSS—the GEOSS Clearinghouse and the Component and Service Registry—through technical support agreements with George Mason University. The FGDC supports the GSDI Association efforts to increase international collaboration on spatial data infrastructure (SDI) development. In support of this, the FGDC coordinates and supports the GSDI Small Grants Program that promotes the adoption of SDI in developing countries around the world. The list of the 17 projects supported in 2012 can be seen at www.gsdi.org/sic1. The GISCorps of Urban and Regional Information Systems Association (URISA) partners in the GSDI Small Grants Program and provides professional services in support of this effort. Through the GSDI Association, the FGDC helps fund the publication of international regional SDI newsletters (www.gsdi.org/newsletters). NSDI Workshop attendees in Zimbabwe. The FGDC currently has nine subcommittees that form communities of interest for nine data themes. In addition, four FGDC working groups crosscut the subcommittees and focus on infrastructure issues common to or supporting many of the NSDI data themes. Federal agencies lead and have responsibility for the thematic subcommittees and working groups. Below are the subcommittee and working group high-level summaries of this year’s activities. Additional information is available at www.fgdc.gov/participation. The Cadastral Subcommittee develops and implements plans to coordinate cadastral data-related activities among Federal, State, Tribal, and local governments and the private sector and reports on its activities to the FGDC. In the western United States, the FGDC Cadastral Subcommittee works with the wildland fire community to identify sources of land parcel data, standardize available data, and build sustainable operational procedures to provide land parcel data in coordination with States. In other regions of the country, such as the Midwest and the Southeast, the subcommittee works with State coordinators to identify county cadastral data contacts and to develop authoritative sources of data with the States. The subcommittee coordinates with the Bureau of Land Management (BLM) to develop sustainable datasets for rights and interests in land parcels that are compliant with the national standards. The subcommittee worked with many of the Cooperative Agreements Program award recipients to support development of cadastral business plans and the development of sustainable, standardized datasets. One of the most notable of these was the partnership with the Appalachian Ohio Geospatial Data Partnership. For more information click here. The National Parcels Work Group continued to provide updates to the existing national inventory (www.gisinventory.net) of cadastral data. All States now have an identified State Cadastral Coordinator and many States have assumed responsibility for sustaining the inventory of local contacts. Discussions are ongoing with Housing and Urban Development about future approaches for access to parcel data by Federal agencies. Via the Public Land Survey System (PLSS) Working Group, the subcommittee and BLM continued support for the standardization of the PLSS datasets from authoritative sources. Efforts in Illinois, Michigan, Minnesota, Missouri, Ohio, and Wisconsin have led to ongoing partnerships with these States and the development of a standardized PLSS that incorporates PLSS Survey Data from the BLM and the U.S. Forest Service (USFS) on Federal lands. The Version 2 updates to the publication standard were started and should be completed in the next year. In December 2011 the Federal Parcel Working Group submitted the final version of its report on the inventory of parcels owned by the United States and managed by Federal agencies. 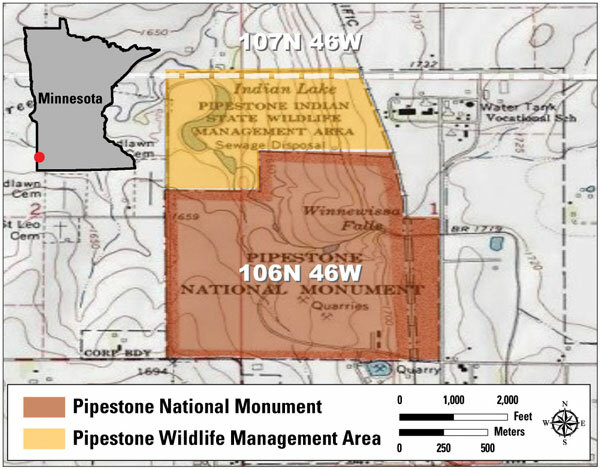 The Federal Lands Subgroup was formed under the Federal Parcel Working Group. The goal of the Federal Lands Subgroup is to merge existing Federal cadastral datasets (boundaries and parcels) into one dataset. The subgroup successfully merged cadastral data from the U.S. 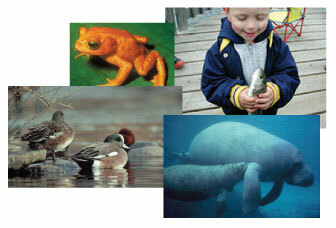 Fish and Wildlife Service (FWS) with National Park Service (NPS) data and identified a set of minimum core attributes. The subgroup is now working with the BLM on a Surface Management Agency data standard, which is intended to be used by all Federal agencies that collect cadastral data. This new data standard will allow the cadastral datasets to be merged into a more cohesive and useable format. BLM’s Mineral and Lands Record Portfolio leads the effort on the Federal Surface Lands Management Agency standard development. Through funding from the USFS and BLM, the Cadastral Subcommittee is assisting with the continued aggregation of standardized parcel data to support the Wildland Fire Decision Support System (WFDSS). These efforts include conducting standardization efforts and monitoring the effectiveness and potential updates to the standardized parcel definitions. Several States have established sustainable programs to provide structure locations for wildland fire, and many other States are developing or approaching completion of sustainable programs. Challenge: With declining budgets and travel limitations at the Federal, State, and local levels, it is challenging for data managers to stay up to date on the latest metadata standards and tools. Training is especially critical as many organizations transition from the FGDC Content Standard for Digital Geospatial Metadata (CSDGM) to the ISO-19100 suite of metadata standards. Action: The NOAA National Coastal Data Development Center (NCDDC) Metadata Team, working with the FGDC and other community metadata trainers, developed a complete package of training materials for the transition to ISO metadata standards. These materials were originally designed to support the traditional classroom learning environment, then modified for a Web-based ISO metadata training series. Result: The first online series was conducted April 5 through May 31, 2012, via hour-long webinar training modules alternating with question-and-answer sessions for a total of 14 sessions. After each session, all materials were made available, including fully annotated presentations and recordings (ftp://ftp.ncddc.noaa.gov/pub/Metadata/Online_ISO_Training/). Instructors were also available on request for special one-on-one “My Metadata” sessions to answer specific questions for individual participants. The 14-week series had a combined 791 participants (257 unique sites) from 13 countries. The goal of the Cultural and Demographic Statistics Subcommittee is to promote the collection, use, sharing, and dissemination of cultural and demographic geospatially referenced data pertinent to the needs of the Nation. These data include the characteristics of the people, the nature of the dwellings in which they live, the economic activities they pursue, the facilities they use to support their health and recreational needs, the environmental consequences of their presence, and the boundaries, names, and numeric codes of geographic entities used to report the information collected. The subcommittee was inactive during fiscal year 2012; however, the NSDI data theme associated with this subcommittee, Cultural and Demographic Statistics, was reevaluated as part of OMB Circular A–16 Supplemental Guidance review. A recommendation was made to eliminate the Cultural and Demographic Statistics Theme and assign the existing datasets to the Cultural Resources Theme and the revised Governmental Units Theme. The Federal Geodetic Control Subcommittee exercises government-wide leadership in coordinating the planning and execution of geodetic surveys, in developing standards and specifications for these surveys, and in the exchange of geodetic survey data and technical information. In fiscal year 2012, the subcommittee continued to engage its partners in its planning and preparation for the new geometric and geopotential datums. Two key subcommittee meetings were held that brought together representatives from 17 Federal agencies, 3 State offices, several private companies, and the National Society of Professional Surveyors. The overarching focus of those meetings was to plan and prepare for the datums of the future that will shift the Nation from a National Spatial Reference System (NSRS), defined by passive monuments, to a system based on observations of real-time Global Navigation Satellite Systems and measurement of the earth’s gravity field. Those changes will result in (1) profound improvements to the accuracy of the NSRS, and (2) enhanced access to the NSRS. to eliminate the sliver polygons and gaps. The United Nations Global Geospatial Information Management Working Group (UN-GGIM) is a new United Nations (UN) intergovernmental body that brings together global level experts from all member states and international geospatial organizations in order to play a leading role in setting the agenda for the development of global geospatial information management. The committee addresses key global challenges, including climate change, disaster management, peace and security, and environmental quality. Support of and information about the changing roles of governments in relation to the growing capability of the private sector to develop geospatial information and location-based services is another key goal of the UN-GGIM. Additionally, overcoming legal and institutional barriers based on principles, policies, methods, and mechanisms for standardization of rapidly evolving technologies, and interoperability and sharing of geospatial data and services constitutes another major focus for the group. Members of the UN-GGIM committee are working together to develop the full potential of geospatial information and its underlying technology; create effective strategies on how to build and strengthen national capacity, especially in developing countries; and compile and disseminate best practices and experiences of national, regional, and international bodies on geospatial information. The UN-GGIM coordinates with the UN Group of Experts on Geographical Names (UNGEGN), the UN Regional Cartographic Conferences (RCC), and the UN National Policies on Geospatial Information groups. The UN-GGIM met in Seoul, Korea, on October 26, 2011; the meeting was attended by 280 participants from 88 member states. Topics covered included: challenges in geospatial policy formulation and institutional arrangement, developing common frameworks and methodologies, international coordination and cooperation in meeting global needs, and capacity building and knowledge transfer. As a subgroup of the UN-GGIM, the FGDC GGIM Working Group was approved by the FGDC Steering Committee in October 2011, and a charter has since been developed and approved. Additional information is available at ggim.un.org/default.html. 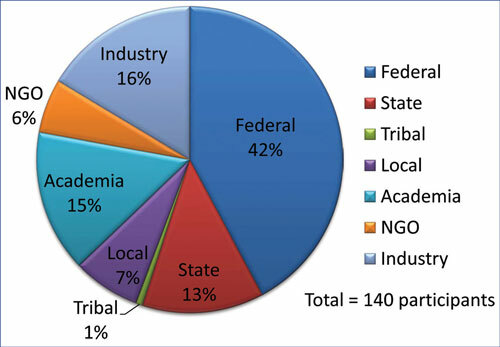 The subcommittee coordinates Federal and non-Federal interests in geologic data, including the facilitation of exchange of information and transfer of data; the establishment and implementation of standards for quality, content, and transferability; and the coordination of the identification of requirements and the collection of spatial data to minimize duplication of effort where practicable and economical. The Geologic Data Subcommittee website is at ngmdb.usgs.gov/fgdc_gds/. The subcommittee has plans to address the FGDC Digital Cartographic Standard for Geologic Map Symbolization and a geologic map database design standard. The subcommittee represents a distributed network of agencies and staff working to advance and implement the marine and coastal elements of the National Spatial Data Infrastructure through the development of coastal and marine data standards, enhanced access to and utility of coastal and ocean framework data, and creation and fostering of strategic partnerships. Sponsored the endorsement of the Coastal and Marine Ecological Classification Standard (CMECS) as the first-ever comprehensive Federal standard for classifying and describing coastal and marine ecosystems. For more information click here. Was instrumental in the release of the Ocean.Data.Gov community on Data.gov. This new community was developed collaboratively by the 15 agencies and departments represented on the National Ocean Council. This new, virtual community provides one-stop shopping for a wide range of data from these agencies; the community is supportive of the National Ocean Policy and its Framework for Effective Coastal and Marine Spatial Planning, a science-based, regional planning process conducted jointly with States and Tribes that guarantees the public and stakeholders a voice in decisions affecting the ocean. For more information see below. A cornerstone of collaborative, regionally based planning is providing access to data that supports transparent, science-based decision making. This is especially true in the coastal and marine environment. In support of the National Ocean Policy established by Executive Order in July 2010, the National Oceanic and Atmospheric Administration (NOAA) created a Coastal and Marine Spatial Planning (CMSP) Data Registry (egisws02.nos.noaa.gov/cmspgisdataregistry/), a Web-based resource to provide access to a collection of NOAA geospatial data sets that directly contribute to comprehensive regional marine planning. Within the CMSP Data Registry, data that have been deemed as supporting high-priority needs from regional planning communities have been organized thematically and served with supporting metadata. 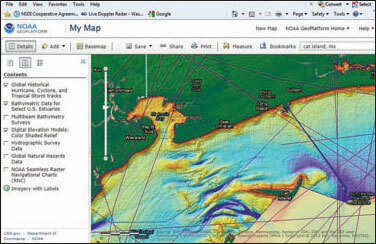 Some of the available data include seamless raster navigational charts, bathymetry, human uses, essential fish habitat, and boundaries for U.S. marine-protected areas. Approximately 50 data sets are included in the registry. Authoritative NOAA data are provided in a variety of standard Web mapping service formats for one-stop discovery, display, and download. Many can be previewed—either individually or simultaneously in a data mash-up with other registry datasets—using Esri’s ArcGIS.com map viewer. These data are also being integrated into Ocean.Data.Gov, which is a venue to be discovered and accessed along with other Federal data through the Geospatial Platform, allowing data to reach an even broader audience. 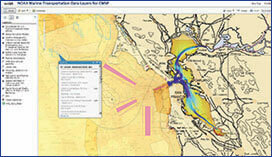 This image shows several of the data layers in the CMSP Data Registry that are useful for marine transportation planning, including bathymetry, habitat, and marine protected areas. The NDOP Subcommittee is responsible for developing a national strategy for acquisition of orthoimagery data for Federal agencies while creating and utilizing partnerships with State, Tribal, local, and private organizations. The U.S. Department of Agriculture (USDA) Farm Service Agency (FSA) National Agriculture Imagery Program (NAIP) includes funding partnerships with the U.S. Department of the Interior, the U.S. Forest Service (USFS), and the Natural Resources Conservation Service (NRCS). NAIP is a 1-meter resolution, leaf on, digital, 4-band imagery program with an optional buy-up of ½-meter resolution. The new contract enables acquisition in Alaska and Hawaii as well as U.S. territories in the Pacific Basin and Puerto Rico. Due to additional funding from FSA, a total of 22 States will be flown over in 2012. The Urban Areas Program is a high-resolution, leaf off program funded by the National Geospatial-Intelligence Agency (NGA) in partnership with the USGS. The USGS provides contributions in the form of partnership building, contracting, and quality control as well as funding support on a limited basis. NGA continues to seek expanded coverage wherever possible. The May 2012 NDOP Steering Committee Meeting agenda focused on archiving and storing imagery. The USGS is planning to sunset its Seamless Viewer and transfer all imagery access and download capabilities to The National Map viewer to satisfy user requests. The USGS has studied the Cloud environment and is planning to move data distribution content to a Cloud environment once appropriate commercial contracts are in place. Pilot activities were conducted independently as well as within the FGDC GeoCloud Sandbox (click here), which validated workflow procedures and showed potential information technology cost reductions while obtaining better reliability and performance. The USGS will move forward with Cloud hosting in fiscal year 2013. In addition, significant testing is ongoing to produce a compressed imagery product that will reduce distribution expense, enabling users to access larger amounts of data while retaining the image quality for interpretive use. NOAA continues to serve most of its imagery and lidar data through the Digital Coast. NOAA has coordinated with the USGS to provide access to USGS CLICK lidar data from the Digital Coast, and NOAA plans to provide access to USGS The National Map imagery from the Digital Coast late in fiscal year 2012. FSA is also investigating Cloud services as a method of distribution for their NAIP imagery. Many of the agencies have been investigating Cloud technologies; it has become evident that efficiencies may be gained within an agency by adopting a Cloud architecture, but there also may be efficiencies through a cooperative implementation between agencies to reduce the expense associated with hosting and delivering orthoimagery to collective users. Cooperative discussions will continue into fiscal year 2013. The Advisory Committee on Water Information (ACWI) and FGDC created the Subcommittee on Spatial Water Data (SSWD) to assist coordination of Federal and non-Federal interests in spatial water data, including (1) facilitating the exchange of information and transfer of data; (2) establishing and implementing standards for quality, content, and transferability; and (3) coordinating the identification of requirements and the collection of spatial data to minimize duplication of effort where practicable and economical. Focused on the national delivery of water quality and quantity results using standard geography, GIS, and internationally adopted standards to harmonize the delivery of sampling points and time series data on flow, water levels, water quantity, and water quality. The SSWD meetings focused on the individual Federal water agencies and their monitored water datasets to explore what would be the advantages, disadvantages, and level of effort involved in implementing a standard geospatial services-oriented architecture. Assisted FGDC efforts focused on the “inland waters” theme and developing definitions to assist with the evolving the Geospatial Platform. The Transportation Subcommittee works to coordinate and support the NSDI and other transportation data-related activities among stakeholders. The subcommittee’s current areas of interest include all modes of transportation, transportation networks, terminals, and services (including intermodal freight and passenger); and the movements of people and commodities using them. Developed an intermodal facility database survey that was presented to the FGDC Coordination Group for comment. The survey was drafted by an internal working group comprised of U.S. Department of Transportation (DOT), the U.S. Census Bureau (Census), and the U.S. Geological Survey (USGS) working group members. Held an open meeting at the 2012 Esri International User Conference. The meeting had representation from the DOT, Census, USGS, and the private sector. Topics addressed included an upcoming intermodal facility database survey, Transportation for the Nation, and USGS\Census\DOT collaboration. The Vegetation Subcommittee works toward the coordination of terrestrial vegetative data-related activities among Federal agencies and establishes a mechanism for the coordinated development, use, sharing, and dissemination of terrestrial vegetation data. Adopted the top three levels of the National Vegetation Classification (NVC) standard (Formation Class, Formation Subclass, and Formation). The content drafted by the Hierarchy Revisions Working Group of the subcommittee was formally peer-reviewed in a process managed by the Ecological Society of America Panel on Vegetation Classification. Co-sponsored an NVC-related workshop, field trip, and symposium with the Ecological Society of America Vegetation Panel at the 2012 Ecological Society of America (ESA) annual conference in Portland, Oregon. Twenty-five participants in the workshop and field trip included representation from Federal and State agencies, academia, and the private sector. The workshop and field trip addressed the topic of sample allocation for vegetation classification and mapping, while the symposium, titled “Frontiers in Measuring, Modeling, and Projecting Long-lived Vegetation Change,” included presentations related to the dynamics of vegetative communities. Held a face-to-face meeting to discuss implementation planning related to the ongoing content development, outreach, and cyberinfrastructure to support the NVC website (usnvc.org/). On behalf of the Vegetation Subcommittee, the ESA Vegetation Panel Education Subcommittee hosted a Mid-Career Managers workshop. Thirty-seven participants from a variety of Federal and State agencies, as well as from the non-profit sector, attended the workshop at the Denver Federal Center. The subcommittee promotes standards of accuracy and consistency in Federal geospatial wetlands data, exchanges information on technological improvements for collecting spatial wetlands data, encourages Federal and non-Federal communities to identify and adopt standards and specifications for spatial wetlands data, and collects and processes the requirements of Federal and non-Federal organizations for spatial wetlands data. Conducted outreach under the Implementation Plan for the Wetlands Mapping Standard through the support of the Association of State Wetlands Managers and the Wetlands Mapping Consortium via workshops, webinars, and information venues. Continued to update the online Wetlands Mapping Training, www.fws.gov/habitatconservation/nwi/wetlands_mapping_training. Developed a draft maintenance update of the Wetlands Classification Standard conducted through a multi-organization working group. The Architecture and Technology Working Group (ATWG) works to improve the understanding and integration of geospatial concepts by mainstream governmental business planners and technical practitioners through varied outreach mechanisms. The ATWG evaluates and develops the technical architecture for the Geospatial Platform, identifies suitable standards and applicability, and supports testing and prototyping of new Geospatial Platform functionality. Focused on the design and management of the Geospatial Cloud Sandbox Initiative, known as GeoCloud. For more information click here. Supported the architectural modeling of the Geospatial Platform environment, its dependencies, and relevant standards—this work resulted in a draft white paper on Geospatial Platform Architecture. The Metadata Working Group promotes awareness among FGDC member agencies of the metadata dimension to geospatial data; facilitates the evolution and revision of metadata standards; and establishes a mechanism for the coordination, development, use, sharing, and dissemination of geospatial metadata among FGDC member agencies. Metadata Working Group (MWG) members provided direct support to the FGDC Metadata Program. Members contributed to quarterly teleconferences, actively participated in the Metadata Summit, submitted comments to the International Organization for Standardization (ISO) 19115-1 Geospatial Metadata Standard Review, and provided constructive feedback during development of the FGDC ISO metadata implementation guidance (www.fgdc.gov/metadata/geospatial-metadata-standards#fgdcendorsedisostandards). The MWG continues to serve as the primary conduit for the distribution of information about metadata standards, tools, training, and implementation in support of the Geospatial Platform and A–16 Supplemental Guidance. Metadata Working Group Members as of June 2012. The FGDC Standards Working Group is responsible for promoting the development and implementation of standards in support of the NSDI. Recommended FGDC endorsement of the Coastal and Marine Ecological Classification Standard (CMECS). The FGDC endorsed the CMECS in spring 2012. For more information click here. The FGDC endorsed the Federal Trails Data Standard in January 2012. Members served on a 2012 NSDI Cooperative Agreements Program (CAP) panel to review project proposals to implement FGDC-endorsed standards. The review panel recommended five CAP project proposals for funding, all of which were approved for funding. The Users/Historical Data Working Group (UHDWG) promotes and coordinates activities among Federal agencies who are primarily users of, not generators of, geospatial data. The intent is to provide a vehicle for those agencies that may not have a significant geospatial infrastructure to collectively share their experiences and needs with the larger geospatial community. Continued a program of outreach to perspective members. The listserv (sun8.loc.gov/listarch/uhdwg.html) for UHDWG members and those interested in its work has been active, not only in announcing meetings, but also as a conduit for discussion of topics such as appraisal of digital assets and digital preservation. Held monthly Web and phone meetings for members to discuss issues and share presentations on related topics. Created an annotated bibliography of documents on the process to appraise geospatial data for acquisition by libraries or archives. Continued the survey of geospatial data managers and databases in the Federal Government to identify stewardship responsibility and to track archival practices. An updated list of contacts has been forwarded to the FGDC Coordination Group for further action. Challenge: Southeastern Ohio has been widely regarded as an area that is behind in technology adoption and capacity. This underserved portion of the State created a barrier to a statewide cadastral fabric but also presented an opportunity to create a model for standards adoption, cadastral development, and data sharing from the ground up. At the 2010 Ohio Statewide GIS Conference several attendees gathered to discuss the need for the development and promotion of standards for the GIS community within the State of Ohio. During these discussions, attendees realized that the underrepresented Appalachian region of Ohio presented an opportunity to educate a community and adopt standards from inception. Conference attendees decided that for the State of Ohio to have a truly statewide GIS data standard, all areas and counties of the State needed to be served and represented, especially Appalachian Ohio. Action: The southeastern Ohio participants convened a meeting to explore the idea of a unified voice and the potential to implement existing GIS standards from the ground up. In December 2010, participants representing counties, regional and State agencies, and the private sector gathered for the first meeting of what would become the Appalachian Ohio Geospatial Data Partnership (AOGDP). Result: In May 2012 the AOGDP completed an NSDI CAP project (www.fgdc.gov/grants/2011CAP/projects/G11AC20061) that focused on incorporating the NSDI Cadastral Standards for the development of cadastral data layers in three adjacent townships in three Ohio Appalachian counties, crossing jurisdictional and spatial data software lines. Just as important, the project also included the creation of outreach programs promoting the incorporation, use, and benefits of standardized cadastral data, with strategies for financing, implementation, and maintenance of the newly developed data. The most beneficial outcome of the project is the creation of an avenue for sharing data vertically among Federal, State, regional, and local levels of government, and horizontally with the private sector, non-profit organizations, and academia. To learn more about the Appalachian Ohio Geospatial Data Partnership and its continuing activites, please visit www.geospatialpartnership.org. Utica Shale under Appalachian Ohio. Continue to provide the management oversight for Office of Management and Budget Circular A–16 Supplemental Guidance and the Geospatial Platform. Challenges: Obtaining continued participation from Federal partner agencies. Finalize National Geospatial Data Asset (NGDA) Datasets and Dataset Stewards and Theme Champions and begin making the NGDA Datasets available via the Geospatial Platform. Work with the NGDA Theme Managers and NGDA Dataset Stewards to implement portfolio management processes. FGDC agencies to identify short-term opportunities to rapidly publish high value maps to the Geospatial Platform to support decision making at executive levels. NGDA Theme Lead agencies to submit a baseline assessment of NGDAs within their Themes. Challenges: Identifying NGDA Dataset stewardship responsibility and developing meaningful and consistent performance metrics for NGDA Datasets and Themes. Release Geospatial Platform version 2.0. Reestablish the data marketplace functionality to enable collaboration on data investments and minimize duplicative spending. 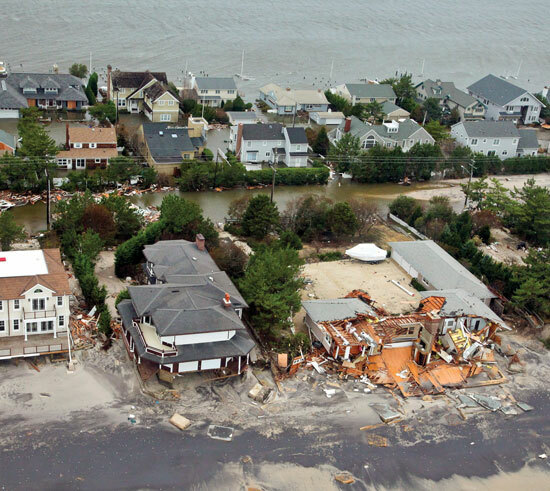 Build new, high profile stories, supported by Geospatial Platform groups, modeled after the Hurricane Response group to communicate cross-government policy issues. Improve the metadata workflow to streamline the process of registering data with the Geospatial Platform and its master metadata catalog at geo.data.gov. Improvements will be completed in concert with the Data.gov team. Develop shared Cloud computing infrastructure for data and application hosting by the FGDC community. This will include opportunities for hosting datasets defined as nationally significant data assets under the Supplemental Guidance to OMB Circular A–16. Revamp the Geospatial Platform website to expand developer and publisher how-to documents and examples; add more dynamic content in terms of rotating gallery images, blog posts, and social media; and, in partnership with Data.gov, expand user communities where colleagues and partners will be able to collaborate using geospatial information. Challenges: The FGDC faces several challenges as the Geospatial Platform moves to full implementation, including defining and publishing National Geospatial Data Assets on www.geoplatform.gov; building a governance structure to address requirements of Federal, State, Tribal, regional, and local governments; capturing cost avoidance and cost savings; implementing comprehensive performance management; and a changing paradigm toward leveraging shared tools and services first. Complete the 12 projects initiated this year that are focused on migrating public-facing data and map servers to the Cloud environment as resources to be registered with the Geospatial Platform. Federal agencies will develop acquisition vehicles for Cloud services that will support most mission-critical geospatial computing and hosting needs. Challenges: System security approval for Cloud implementations continues to be the most significant challenge to deployment across the Federal government. The sharing of Federal Risk and Authorization Management Program (FedRAMP) security documentation with future GeoCloud projects will simplify and accelerate the system security approval process. Also, although Cloud hosting of most geospatial data services and applications appears to be quite affordable and shows good performance and bandwidth relative to government data centers, hosting of terabytes to petabytes of data in current commercial Clouds may be cost prohibitive for some projects. The National Geospatial Advisory Committee (NGAC) will provide ongoing review, feedback, and recommendations regarding the development and implementation of key issues and initiatives, including the continued development of the Geospatial Platform, the development of portfolio management approaches, geolocation privacy issues, and partnerships with other levels of government. The NGAC will hold three to four public meetings in fiscal year 2013. The FGDC will manage the review, disposition, and implementation of NGAC recommendations and complete the next cycle of NGAC nominations and appointments. Challenges: A continuing challenge for the NGAC will be to develop advice and recommendations that identify opportunities to develop partnerships and leverage scarce resources to continue to develop interagency and intergovernmental geospatial initiatives in an environment of declining resources. Focus on implementation of core geospatial standards that support the Geospatial Platform. Complete a review of member agency participation in the FGDC Standards Working Group (SWG) and other standards bodies. The review seeks to expand SWG membership and systematize SWG voting on standards proposals and draft standards. Review the FGDC standards program of work to identify standards projects that should be advanced or discontinued and standards that should be added, revised, superseded, or withdrawn. Challenges: The FGDC should strive for better information flow from Open Geospatial Consortium (OGC) Technical Committee and Planning Committee representatives of FGDC member agencies to the FGDC standards activity. 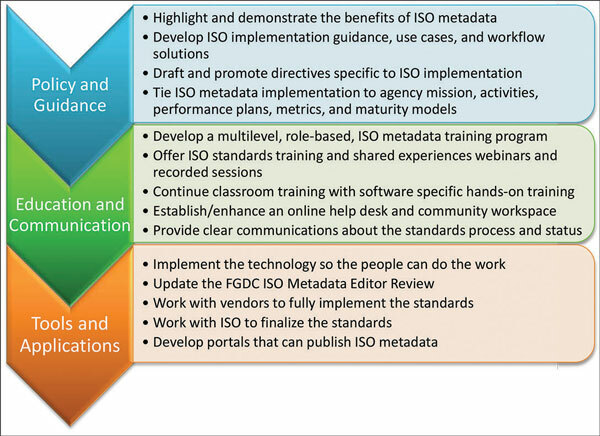 Develop new guidance, training, and online resources to support transition from the Content Standard for Digital Geospatial Metadata (CSDGM) to the International Organization for Standardization (ISO) suite of geospatial metadata standards. Redesign the FGDC Metadata Program website to better inform and support the metadata community. Encourage and facilitate NSDI stakeholders to develop and implement metadata training and support programs. Challenges: The FGDC Metadata Program faces the challenge of developing specific ISO metadata standard implementation guidance and support given the continually shifting status, format, and content of the standards. In addition, the technical expertise, software dependency, and geospatial metadata investment of NSDI stakeholders varies greatly, resulting in the need to address an extremely wide range of implementation issues and needs. 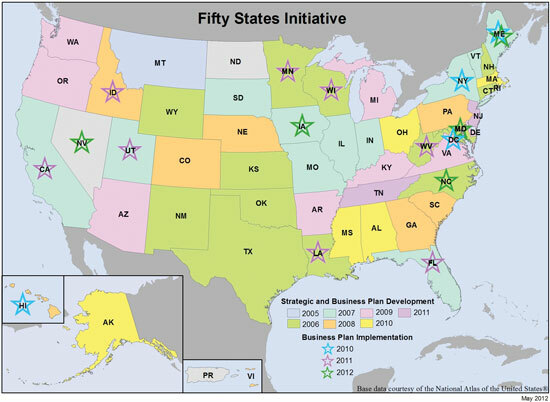 In fiscal year 2013, six NSDI Cooperative Agreements Program awards are planned for the Fifty States Initiative. Three of the awards will go to federally recognized Indian Tribes for the development of geospatial strategic plans. In terms of goals for the Group on Earth Observations/Global Earth Observation System of Systems (GEO/GEOSS), a continuing focus is on simplifying access to quality Earth observation data and services. This will be achieved through enhancements to the existing portal and search components, two of which are hosted and maintained by the FGDC/USGS. Challenges: Limited registration of datasets that support a taxonomy of community-agreed Earth observation parameters, the variety of data access and distribution policies worldwide, and a need for expanded outreach to promote use of GEOSS to find and exploit Earth Observation data. New funding sources for the Global Spatial Data Infrastructure (GSDI) Small Grants Program and the regional Spatial Data Infrastructure (SDI) newsletters need to be investigated. Update and enhance the FGDC training website. Enlist FGDC Program Leads to assist with the coordination and dissemination of training materials. Challenges: Coordinating content development and publication among subject matter experts located in a variety of organizations and balancing the use of advanced online learning technology with the need for commonly formatted materials that can be accessed, edited, and applied by trainers. Establishing a clear coordination role with Federal land agencies to support individual agency efforts in developing rights and interests datasets conformant with the national standards, and continue to work with FGDC Cooperative Agreements Program award recipients and States and local agencies in the deployment and sustained delivery of standardized data. The Federal Parcel Working Group will work, in consultation with the user community, to develop a draft core data publication standard for Federal parcel data. The Public Land Survey System (PLSS) Working Group will complete Version 2 of the PLSS publication standard, including gathering comments. Due to a realignment of the related A–16 data themes, the subcommittee will be dissolved in fiscal year 2013. Continue education, outreach, development of transition tools and applications, and capacity building activities to prepare users for the transition to new geometric and geopotential datums. Identify common objectives and find opportunities for cooperative projects and tasks related to standardization and updates to vertical datums. Within each Federal agency, identify products and services that will be impacted by new vertical datums. Update existing guidelines, standards, and specifications to support the transition to new vertical datums. Using comments and suggestions from users, consider revising the FGDC Digital Cartographic Standard for Geologic Map Symbolization that was released in 2006. The Geologic Data Subcommittee has long proposed to work toward a standard database design for geologic map and related information. Several candidate models are now sufficiently mature to be considered; these will be evaluated and decisions will be made regarding whether a single design can be proposed as a Geologic Map Data Model Standard. Support activities related to OMB Circular A–16 Supplemental Guidance and the Geospatial Platform. Seek opportunities to expand the National Agriculture Imagery Program (NAIP) wherever possible. Continue the discussion of a method for NAIP imagery distribution via Cloud architecture within an agency or cooperative implementation between agencies. Continue to monitor the operations and maintenance activities associated with the core data layers that include the National Hydrography Dataset (NHD), the Watershed Boundary Dataset (WBD), and key derivatives of the National Elevation Dataset (NED). Continue efforts to review and inventory participating agencies’ surface-water monitoring and gaging datasets, documenting the steps necessary to implement the newly established OGC standards concerning WaterML2.0. Administer the intermodal facility database survey and analyze results to develop a scheme, the data, and the process steps for an improved intermodal facility database. Identify a baseline of transportation datasets (non-road) that would complete the Transportation for the Nation initiative. Update the National Vegetation Classification (NVC) website (usnvc.org/) to reflect the most current content in the NVC. Develop online outreach materials based on feedback from the March 2012 workshop held at the Ecological Society of America (ESA) annual conference. Work with the ESA Vegetation Panel to develop an approach for completing Division-level concepts of the NVC standard. Continue outreach to Federal partners to build support for the full implementation of the dynamic content of the NVC, including the cyberinfrastructure and ongoing peer review process. Continue outreach for the Wetlands Mapping Standard and expand the training course and opportunities. 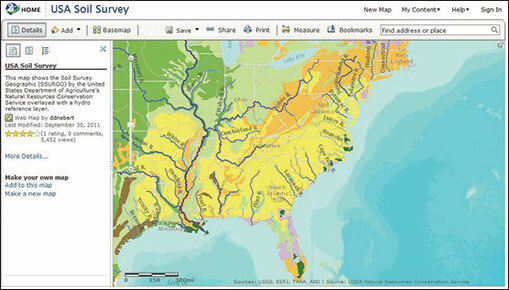 Increase information available on the uses of Wetlands Data Layer geospatial data. Provide wetland data to support the National Ocean Policy Implementation Plan’s task of investigating how to reduce wetland losses on coastal watersheds. Complete the second edition of the Classification of Wetlands and Deepwater Habitats FGDC–STD–004. Collaborate with the National Hydrography Dataset (NHD) and stakeholder groups to craft a national geospatial strategy and implementation plan to further the development of the Water - Inland Data Theme under the National Spatial Data Asset Portfolio. Oversee a third year of GeoCloud hosting and facilitation using the two developed reference platform software “stacks” for open-source and commercial geospatial solutions. Support evolving design and architecture needs of the Geospatial Platform. Review and update the working group charter. Facilitate communications regarding shared metadata implementation experiences and strategies, particularly with respect to the International Organization for Standardization (ISO) suite of geospatial metadata standards. The FGDC Standards Working Group will continue its active participation in external standards bodies that include International Organization for Standardization (ISO) Technical Committee 211, Geographic information/Geomatics (ISO/TC 211); InterNational Committee for Information Technology Standards Technical Committee L1 (INCITS L1), Geographic information systems; Open Geospatial Consortium (OGC); and Geospatial-Intelligence Standards Work Group (GWG). Continue working group outreach to all interested parties, both inside and outside the Federal Government. Continue to provide input on the Geospatial Platform. Complete the geospatial appraisal annotated bibliography. Remain active in the development and maintenance of the database listing data steward contacts across the Federal Government. Continue to provide coordinated input to the Library of Congress Geospatial Data Preservation Resource Center. Explore ways to provide input to Data.gov on providing enhanced access to historic geospatial datasets. Report on and liaison with the International Council for Science’s Committee on Data for Science and Technology (ICSU CODATA) Task Group on data at risk.